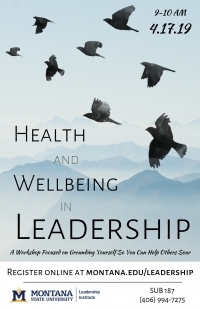 SUMMARY: Registration is now open for “Health and Wellbeing in Leadership”. Topics to be covered include introspection and the power of silence, the interconnectedness of the body and mind, and how self-care can help us give more as leaders. Space is limited. To register for this free workshop, visit https://tinyurl.com/y4mds6mz. The deadline for registration is Friday, April 12th. Bozeman - Registration is now open for “Health and Well-Being in Leadership”, a workshop on how to ground ourselves to help others soar. The workshop will take place on the morning of Wednesday, April 17th from 9:00AM. to 10:00A.M. with an optional 30 minute yoga class starting at 8:15 a.m. featuring four therapeutic dogs. According to the American College Health Association in the fall of 2018, within the last year 86.5% of students reported that they felt overwhelmed by everything they had to do. Additionally, 49.7% of respondents indicated that within the last 12 months, academics have been traumatic or difficult to handle. Students experience multiple sources of pressure during their college years, and this workshop aims to provide tools to maintain a healthy and productive mindset. Topics to be covered include the importance of silence and solitude, the interconnectedness of the body and mind, and how sometimes, being “selfish” can help us give more as leaders. Attendees will hear from and participate in a group meditation led by guest speaker Megan Saab, professional counselor and mindfulness expert from MSU’s Counseling and Psychological services. Those attending will be treated to a healthy breakfast bar at 8:45AM to start the day off with a nourishing meal. Space is limited. To register for this free workshop, visit https://tinyurl.com/y4mds6mz. The deadline for registration is Friday, April 12th. For more information, visit www.montana.edu/leadership or facebook.com/MSULeadershipInstitute or call 406-994-7275.